Well, we know where we’re retiring to. Along with half the estate agents on the planet we suspect. Bahrain’s Ithmaar Bank has announced the planned development of a $1.6 billion island for the healthcare industry. Dubbed “Health Island,” development is due to start “soon”, said a bank official who refused to be named. As well as medical facilities, hotels and apartment buildings are planned for the island, which will be located off the north coast of Bahrain near Muharraq. Investors are eyeing the Gulf’s healthcare industry as the region’s population booms, and the government becomes less willing to provide the free healthcare it has in the past. Ithmaar is also working on a $1.2 billion beach resort and a $175 million hotel that complies with Islamic law also to be located in Bahrain. A $1.6 billion Health Island is expected to make a significant contribution to the local economy. The development could revolutionize the country’s healthcare system and help turn it into a regional hub for health tourism. 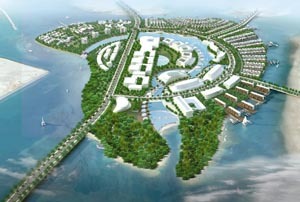 Health Island will feature the latest facilities and services within in a landscaped resort built on reclaimed land. Work will get underway shortly with reclamation of the seabed and construction on the project is expected to take three to five years. People will be able to live there full time in apartments, villas and condominiums with 24-hour-a-day access to medical care. Among the main features will be a 358-bed “wellness hospital” catering to medical aesthetics, nutrition, diagnostics, alternative medicines and sports medicines. In addition, a 216-bed children’s and women’s hospital will cater to a range of maternal and pediatric care. Three five-star hotels are planned, with French, Thai and Chinese themes, each with 60 to 70 villas and suites, along with a Middle Eastern and Turkish inspired four-star hotel of 110 rooms. Amenities will include two-storey to four-storey buildings for supermarkets, commercial and retail outlets, cinemas, arcade and waterfront restaurants. Singaporean company, DP Architects, responsible for the Dubai Mall and Dubai Marina Mall and Hotel along with several other major medical facilities, have designed the master plan, which will cover 1.25 million square metres. The diagnostic centre will be the first to be built. Up to 15 per cent of patients diagnosed at the Health Island’s centres would need hospital care, and IDC has held preliminary discussions with a number of hospitals in the Far East and Europe on how they can be involved. Nicaragua: No Longer Land of Sandinistas and Somozas but a Real Estate Opportunity.